Home > Does Insurance Cover Contractors for Claims of Defective Work? Recently, I was asked whether a contractor would be covered under a commercial general liability (“CGL”) insurance policy for faulty workmanship. This issue was explored in the case of State Farm Fire and Casualty Co. v. McDermott, 2014 WL 5285335 at *6 (E.D. Pa. Oct. 15, 2014). In State Farm v. McDermott, a dispute arose out between a private contractor, McDermott, and the PulteGroup, a home developer, in connection with plastering, stucco and flashing and felt paper installation work provided by McDermott for approximately 299 homes in a residential development. The home developer was later sued by homeowners as a result of ongoing and recurring water infiltration issues. After engaging a water intrusion specialist, the PulteGroup determined that the water infiltration issues were the result of defects in the work of McDermott. The home developer then sued the private contractor, setting forth claims for negligence and breach of contract/warranty. McDermott, in turn, sought out defense and indemnity from their insurer, State Farm, under McDermott’s CGL policy. Operating under a reservation of rights, State Farm challenged their obligation to cover McDermott, maintaining that the PulteGroup’s claims did not trigger coverage under McDermott’s CGL. In Pennsylvania, “[a] carrier’s duty to defend and indemnify an insured in a suit brought by a third party depends upon a determination of whether the third party’s complaint triggers coverage.” Kvaerner Metals Div. of Kvaerner U.S., Inc. v. Commercial Union Ins. Co., 908 A.2d 888, 896 (Pa. 2006). “The Pennsylvania Supreme Court has also emphasized that Courts are to determine the obligation by a casualty insurance company to defend and indemnify an action brought against an insured solely by the allegations of the complaint.” State Farm, 2014 WL 5285335 at *6 (citing Knaerner Metals, 908 A.2d at 896). Under McDermott’s CGL, an insured can only obtain coverage if the alleged bodily injury or property damage is caused by an “occurrence,” which is defined under the CGL policy as an “accident.” Looking past the technical claim for negligence and focusing on the substance of the PulteGroup’s complaint, the court in State Farm v. McDermott held that there was no coverage for McDermott under the CGL policy and that State Farm was not required to defend or indemnify McDermott in connection with the PulteGroup action. Specifically, the court in State Farm v. McDermott, citing other Pennsylvania cases interpreting identical language in CGL insurance contracts which defined “accident” as “[a]n unexpected and undesired event, or something that occurs unexpectedly or unintentionally,” reasoned that McDermott’s potential liability stemmed from his alleged failure to meet contractual obligations and that his failure to live up to his contractual obligations “cannot be seen as an accident or some unforeseeable event, as McDermott was specifically tasked with forestalling such a result.” Id. at *9. In addition, the court noted that “Pennsylvania law does not recognize the applicability of a general liability policy to breach of contract and breach of warranty claims….” Id. at *7. 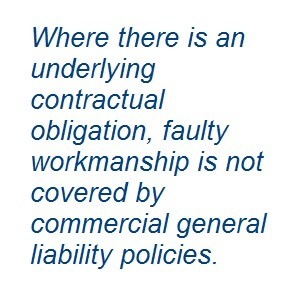 Thus, where a contractual obligation is owed, there is no CGL coverage for negligent work performance. This article was written by P.J. Gallo, a member of the firm’s Litigation Department. P.J. 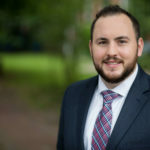 Gallo concentrates his practice in the areas of business and commercial litigation, construction and architectural liability, and insurance coverage disputes. With respect to his construction litigation practice, P.J. represents commercial and residential property owners in cases involving construction and design defects. He can be reached at [email protected] or 610-840-0246.